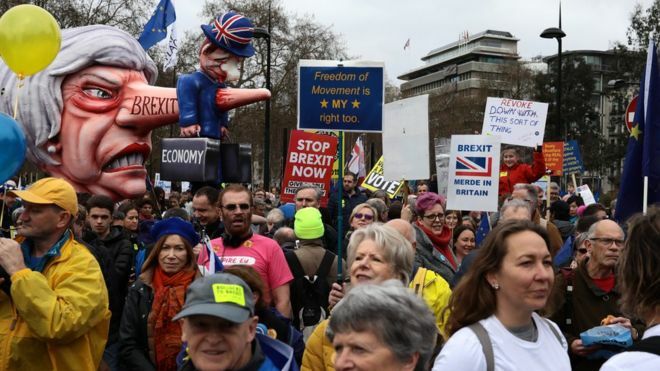 Hundreds of thousands are marching through central London calling for another EU referendum, as MPs search for a way out of the Brexit impasse. PM Theresa May has said she will ditch plans for another vote on her Brexit deal if not enough MPs support it. Unless that deal is passed by MPs, the UK will have to come up with an alternative plan or else face leaving without a deal on 12 April. London Mayor Sadiq Khan tweeted a video of himself joining demonstrators holding up a 'Put it to the People' banner at the front of the march as it began. He was flanked at the front of the march by Liberal Democrat leader Vince Cable, who tweeted that there was a "huge turnout of people here from all walks of life". Meanwhile, a record-breaking online petition on Parliament's website calling for Brexit to be cancelled by revoking Article 50 has attracted more than 4.3 million signatures. As the number of signatures on the petition continued to climb, its creator Margaret Georgiadou said she had "received three death threats over the phone", and a "torrent of abuse" via her Facebook account. Liberal Democrat MP Layla Moran said the petition could "give oxygen" to the campaign for another Brexit referendum.